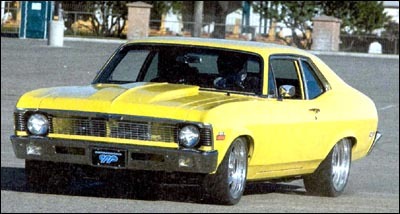 In the last two issues of SUPER CHEVY, we ran a series of suspension installs on this mellow yellow '70 Nova. We also flogged the Nova and its TCI suspension and ended up with some of the fastest track times we have recorded yet. This time around we're going to follow what work was done to this Nova in order to get it to the track and around those cones. 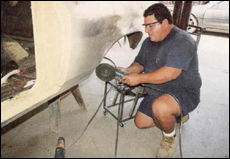 Jim Reis, owner of both the Nova and Classic Performance Parts (CPP), lit some fires in order to get his Nova built and running before the '07 SEMA Show. Mission accomplished. 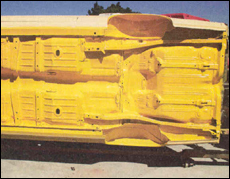 So let's take a look at a small portion of the bodywork and what was done. 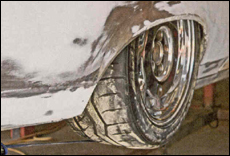 Most third-generation Nova owners are very well aware of the fact that the factory rear inner quarters allow almost no room for a tire wider than 6 inches. That's nice if you plan to keep the Nova in its stock grocery-getter state, but what if you want to throw some bigger, thicker meats in the back? Tubbing the back half would be a great solution, but that re quires extensive amounts of work, and if you're going to drag race a Nova, that's a fine way to go. But if you aren't going to drag race, what do you do to fit a well-performing street tire in the back? 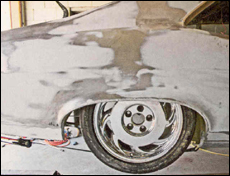 The guys at Dreamers Creation Paint & Body worked on a simpler solution when it came to the rear tire size dilemma. 1..The first step was to create a solid foundation. No sense in having a Flintstones-style car where your feet hang out the bottom. 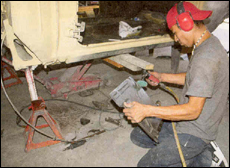 Sheetmetal from Classic Industries and Modern Performance was used throughout the Nova's build. 2..The new sheetmetal is trimmed down and ready to fill the gaping hole in the floor that was just cut. 4..Thankfully, only the very front of the floors needed replacing. It would have been a bear if the entirety of the floors was rotted. 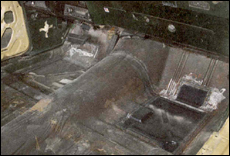 5..The OE trunk floor also had some rust issues, and the easiest remedy was to cut the old metal out and replace it with new steel from Classic Industries and Modern Performance. 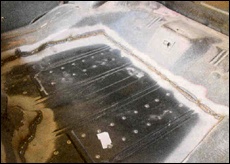 7..They did an excellent job with panel alignment, and all the door, hood, and trunk gaps are true and squared. 8..The biggest test was to see how much tire they could reasonably fit in the rear. While these are not the l8x7 wheels and the 275/40R18 Toyo tires that were planned for the back, this mock-up does demonstrate that bigger meats in the back will work. Let's take a look at what they did to make this happen. 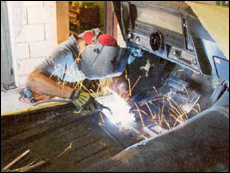 9..The first step is to grind out the spot welds that hold the outer and inner quarter-panels together. Once these two panels are separated, it will be easier to make the necessary adjustments. 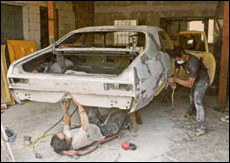 10..With the Nova flipped on its side, we can see where the guys at Dreamers Creation cut into the inner fenderwell. You may notice the lip of the outer quarter-panel has a line drawn down the middle; the lip will be cut off as well. Every little bit counts. the outer quarter-panel. After everything is tested and fitted, it's all tack welded in place. The original wheelwell was more rounded and shaped much like an upside-down U. The upside-down U is now squared off, allowing more tire to fit under the car. 12..The tack welds are all filled in and ground smooth. 13..This final shot shows how nice it looks when everything is patched, welded, and painted. 14..The view from inside the trunk shows exactly how the new wheelwells looks. Sometimes being a square is a good thing. 15.. Both wheelwells are done and the entire underside of the vehicle is painted and ready for action. 16..The crew at Dreamers Creation is proud of the Nova it just finished, and it's ready for paint.